Hello my name is Morgan and I'm a self described carboholic. I could live off of a diet of bread and pasta alone. Fortunately for my waistline, however, I resist living on an all carbohydrate diet and do my best to limit carb intake as much as possible. I could never fully restrict myself from pasta though. I love it too much. That's why I was so excited when I came across this recipe on Pinterest. I was craving pasta yesterday like nobody's business, so I took to Pinterest to search for a pasta dish that I wouldn't feel overly guilty about indulging in. 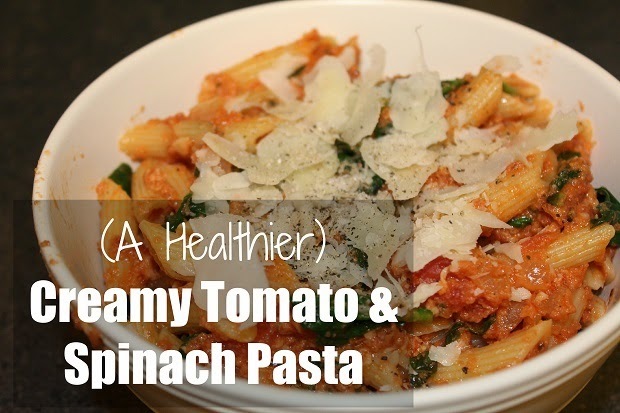 This Creamy Tomato & Spinach Pasta caught my eye, and I was even more intrigued when I saw that the original pinner had created a healthier alternative to the dish. I rushed right to the store after work to pick up the ingredients, and I couldn't get home fast enough to start cooking. It was an easy and quick dinner option, perfect for a Monday night! It looked delicious when it was all said and done, and it tasted even better than that! It's safe to say this will became a staple in the Sparks home. - Add diced tomatoes, oregano, basil, salt and pepper to the skillet with the onions and garlic. Stir to combine. - Add 1/2 to 3/4 jar of marinara sauce and stir until combined. - Turn heat to low and add greek yogurt to the skillet. stir in yogurt until fully melted and the sauce is creamy. - Add half of your Parmesan cheese and whisk into mixture until cheese has melted then add the remainder of Parmesan and repeat. - Once mixture is combined, add the fresh spinach and stir into the sauce until spinach has wilted (about 3 minutes). - Add pasta into the sauce and stir until pasta is well coated. Enjoy! ** Optional: Add grilled chicken on top of pasta dish for added protein or if you have a husband who refuses to call food a "meal" unless there is meat involved. Recipe found via Pinterest on Ellie Bean Design. This looks amazing!!! I am like you, I can't quit carbs and look for lighter versions of our favorites! Yum this looks amazing. I am a HUGE carb lover too but I need to back the heck off of them.